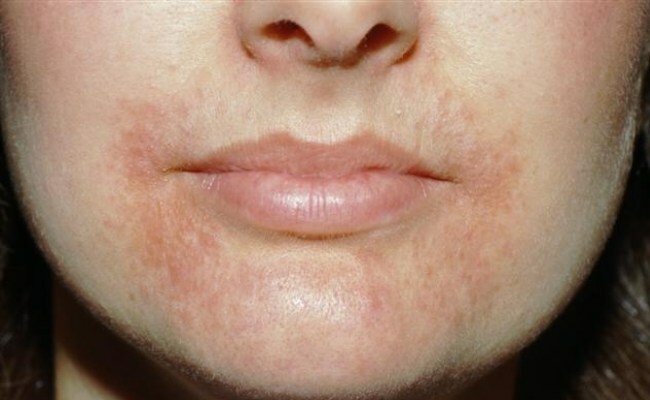 Perioral dermatitis is the inflammatory rash which appears on facial skin around mouth. Perioral is known as periorificial dermatitis. The main reason of dermatitis is not known. Bacterial or fungal infections, rosacea, constant drooling, use of fluoridated toothpaste, oral contraceptives, and sunscreen can also be reason of perioral dermatitis. This infection is common in young women. But this can also find in men and children. Rash of red bumps around the mouth and around nose. Treatment of Perioral dermatitis can be lengthy. Stop using facial creams is helpful to get rid of Perioral Dermatitis. Here are best home remedies listed which can help in perioral dermatitis. Apply this solution gently on the affected area. Rinse off this with cold water. You can use some olive oil. Repeat thrice in a week. You can drink 1 teaspoon apple cider vinegar with water. Grapefruit seed extract is also a good natural home treatment for perioral dermatitis. It contains antifungal, antiseptic and anti-inflammatory agent which helps to deal with the painful symptoms. Take 6 drops of grapefruit seed extract and 1 tablespoon of castor. Take a cotton ball and soak in this solution. Aapply it on the affected skin. Repeat twice is a day. Aloe vera is a very effective natural remedy for skin related issue. It can also be very helpful for perioral dermatitis. Aloe vera contains anti-inflammatory and antimicrobial compounds. Take fresh aloe vera gel and apply on face. You need to clean the skin before apply aloe vera. Repeat 4-5 times in a day for a few weeks. Yogurt is the well known home remedy for the skin. It is also helpful in the perioral dermatitis. Yogurt contains good bacteria and antibacterial agent which helps eliminate bad bacteria on the skin. It has also cooling properties which helps to reduce inflammation, redness as well as pain. Take yogurt and apply directly on affected area. Leave it for few minutes and let it be dry. Repeat thrice in a day for a few weeks. Oatmeal is also a very effective home remedy for skin rashes, itching, which causes by perioral dermatitis. Take half cup of oat meal with a little water. Prepare the paste with this. Repeat this twice in a day until the rash is gone. These natural home remedies help to get rid of perioral dermatitis. You should avoid the oily food and junk food.